DRAW REVIEW: The Men’s EHF Cup Qualification Round 3 Draw in Vienna has determined all 16 pairings for the last knock-out round before the group phase. Frisch Auf Göppingen, the back-to-back winners of the Men’s EHF Cup in 2016 and 2017 will launch their run for a three-peat in two qualification round 3 matches against OIF Arendal from Norway. 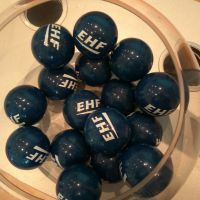 The draw at the EHF Office in Vienna has determined all 16 pairings of the Men's EHF Cup Qualification Round 3, which will be played on 18/19 November and one week later. The draw was conducted by the EHF Comptrollers Alain Koubi and Robert Prettenthaler together with Markus Glaser, the EHF Chief Sports Officer. One of the most exciting matches in the last qualification round before the group phase consists of the 2015 winners and last season’s runners-up Füchse Berlin and Futebol Clube do Porto, while the third German team SC Magdeburg will lock horns with HC Dobrodgea Sud Constanta from Romania.